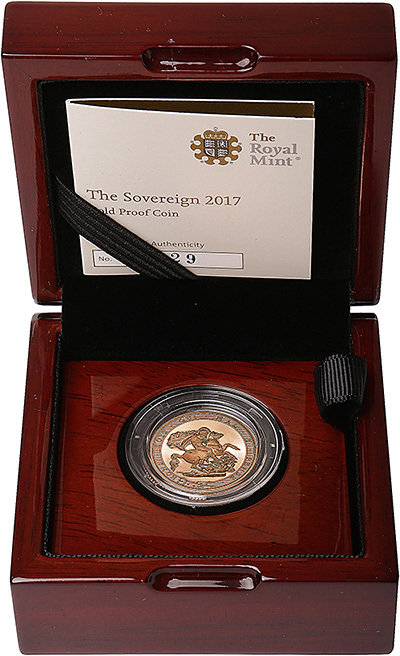 The 2017 gold proof sovereigns were released in November, 2016. We received our first delivery on 11th November, 2016. Temporarily out of stock. We have sold out of our first allocation. If you are interested in purchasing one, please join our mailing list and we'll inform you once they're back in stock. Please note, we will not have an update from our supplier until the end of March. 2017 is the 200th anniversary of the first modern sovereign and Benedetto Pistrucci's St George and the Dragon design. 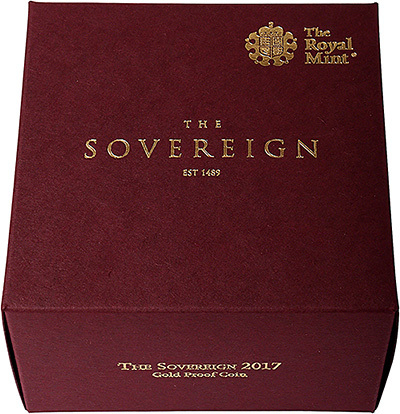 The proof version of the 2017 sovereigns feature a remastered version of the original St. George and the Dragon design. The 2017 design features the addition of the garter border and inscription, which appeared on the original design. The garter inscription on the St. George and the Dragon reverse reads "Honi soit qui mal y pense", which is French for "Shame be to him who thinks evil of it". This is the motto of the Order of the Garter, the highest order of chivalry in the UK. Find out more on our Honi Soit Qui Mal Y Pense page. 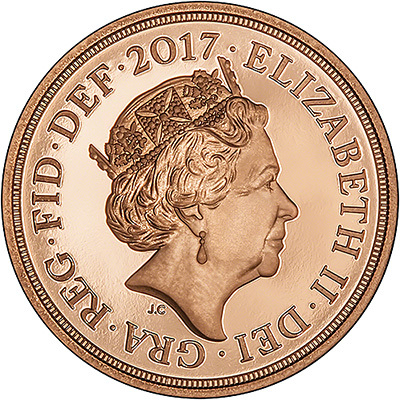 The fifth coinage portrait of Queen Elizabeth II features on the obverse of the coin. This was designed by the artist, Jody Clark. It is the first time since 1887 that the date has been featured on the obverse of the sovereign. 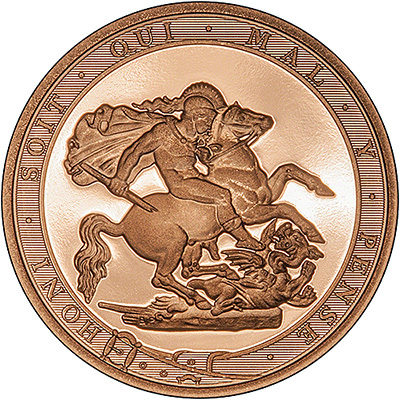 A special, remastered version of Benedetto Pistrucci's St George and the Dragon design features on the reverse of the coin. The Royal Mint crafted the tools for the design from the 1817 original. These coins are presented in a wooden presentation box, and accompanied by a certificate of authenticity from The Royal Mint. Not only can we guarantee that our prices for the proof coins are cheaper than The Royal Mint's but buying from us you also get the benefit of buying from expert professional numismatists who have been in the business for over 50 years. While we appreciate the Royal Mint have existed for longer, we know more about sovereigns and half sovereigns than they do! The 2017 bullion sovereign will be released on 8th December, 2016.The design features the St George reverse, as used in previous years.